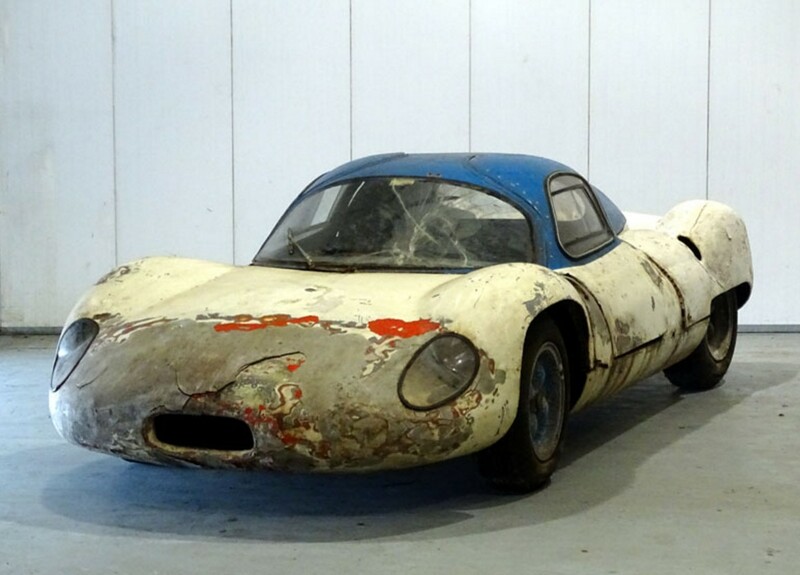 When the Walkett brothers founded Ginetta Cars in 1958, do you think they had any idea their company would still be involved in the highest levels of motorsport 60 years later? They started out building kit cars and in 1961 they hit it big when the G4 went on sale. The G4 was nice because it was a usable car and a great race car. With a fiberglass body and reliable Ford powerplants, the cars were competitive and sold well – about 500 were produced through 1969 when production stopped (though it restarted in 1981 and lasted through 1984 with about 35 additional “Mk IV” examples built). This car is powered by a 1.5-liter Ford inline-four. 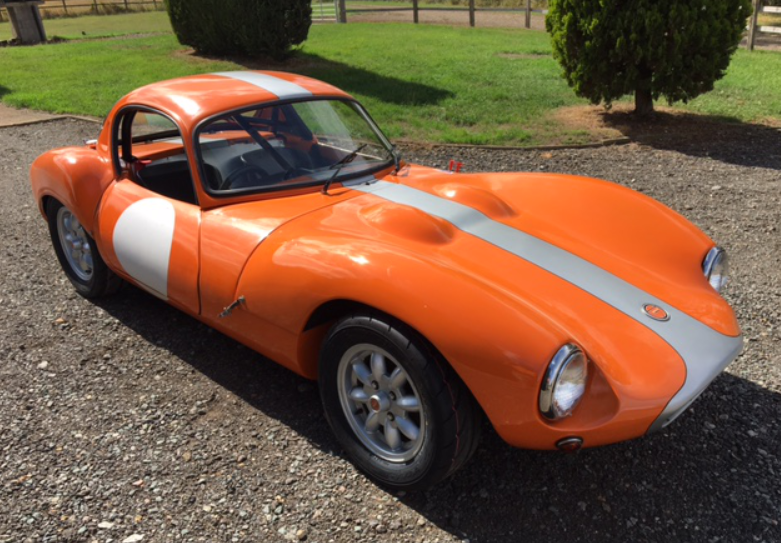 Painted in bright orange, the car was recently restored, including work performed by Ginetta Heritage. It’s race and road ready and should cost between $32,000-$40,000. Click here for more info and here for more from this sale. The first Porsche 911 went on sale in 1964, replacing the 356 series of cars. Upon introduction, only a two-door coupe was offered. A removable-top Targa joined the lineup in 1966 and the first 911 convertible didn’t arrive on the scene until 1982. So what was a well-heeled Porsche fanatic to do in the 60s? Let’s start by not forgetting that Karmann came up with a 911 Cabriolet Prototype in 1964. So then, in 1966, a Southern California Porsche dealer wanted an open-top 911 for his customers and commissioned Bertone to build one. They started with a bare 911 chassis, which did not include the “S” 160 horsepower, 2.0-liter flat-six that the car carries today. Back then it had a stock 130 horse variant. 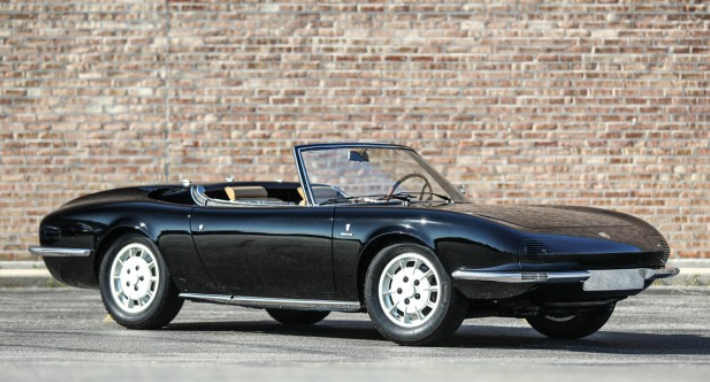 Rear-engined convertibles tend to seem a little bulky at the back and it’s funny that Gooding & Company draws parallels to the Fiat 850 Spider, which is the exact car I see when I look at this. The final result here is quite nice and nothing about it says “Porsche.” It looks Italian. The current owner acquired this car in 1993 and it’s been on static display for quite some time, so it will require a little attention to make roadworthy. It should bring between $700,000-$1,000,000. Click here for more info and here for more from Gooding & Company. 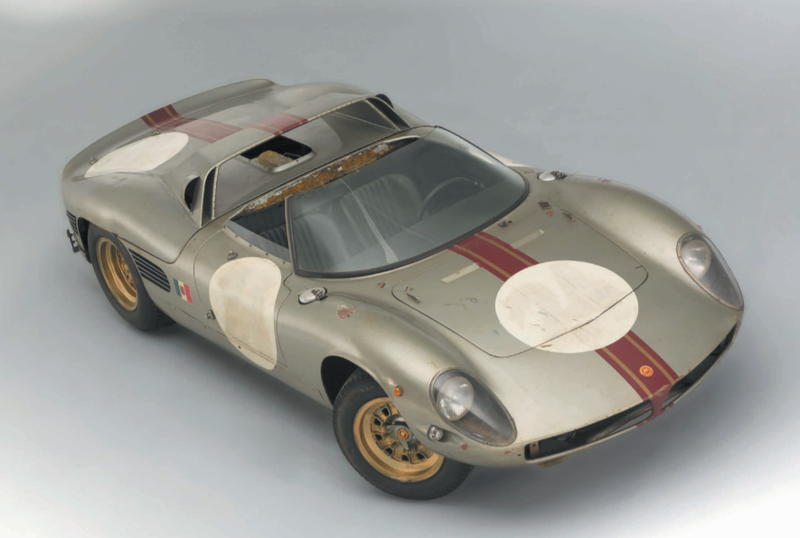 We all know the story of the GT40 by this point: Ford wanted Ferrari. Ferrari said no. Ford decided to whip Ferrari at Le Mans. And then did just that. The first GT40s hit the track in May 1964. Later that year, after disappointing results, the racing program was given to Carroll Shelby and he turned it around. 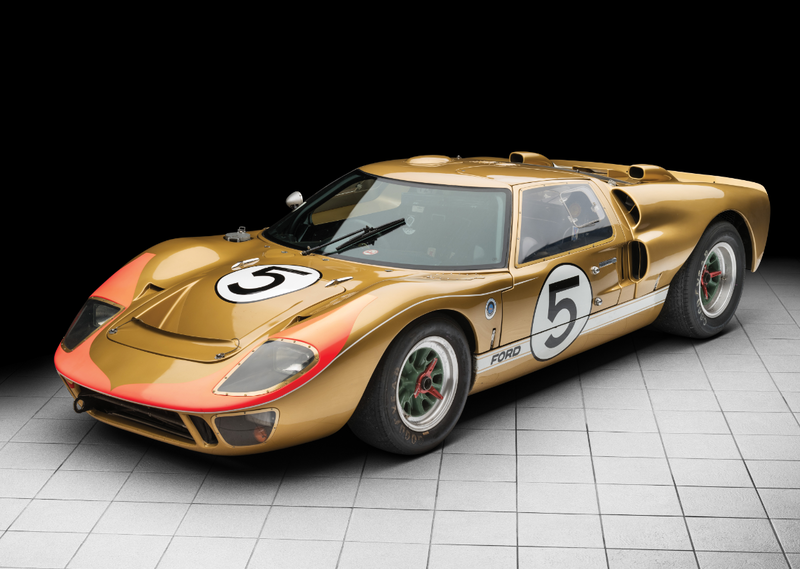 Using 1964 and 1965 as “work-out-the-bugs” seasons, Ford applied an upgrade to the GT40 for 1966. Dubbed “Mk II,” the cars now carried monstrous 7.0-liter V-8 engines. These 427s were built by Holman-Moody of NASCAR fame and boasted 450 horsepower. To handle the extra weight of the stock car engine, Kar Kraft upgraded the Mk II’s chassis, suspension, and engine mounts. And oh boy, what a package it was. In 1970, Ford donated this car to the Harrah Collection. A few other private owners followed, with a restoration coming in the 1990s. One of only eight examples of the Mk II produced, this car is well acquainted with the historic show and race circuit, accumulating refurbishment as-needed along the way. Coming out of nearly a decade and a half of continuous ownership, this GT40 will be overshadowed (in price and in conversation) by RM’s consignment of a 250 GTO. But this is a far more historically important – and interesting – car. Click here for more info and here for more from this sale. The first Lamborghini road car was the 350 GT grant tourer. 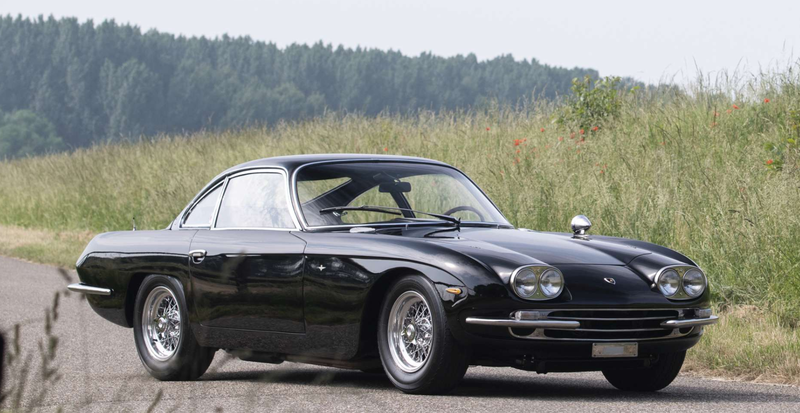 Ferruccio’s followup was the improved 400 GT. The first 400 GTs were just 350 GTs with a bigger engine. Introduced later in 1966, the 400 GT 2+2 featured slight styling changes (thanks to Carrozzeria Touring) as well as the bigger engine. That bigger engine is a 4.0-liter V-12 making 320 horsepower. This is also a true 2+2 with two seats in the back. Part of the aforementioned styling tweaks include a longer roofline that increased greenhouse space within the car, allowing for a human to sit in the back. This car also featured a Lamborghini-designed transmission. Built only between 1966 and 1968, the 400 GT was still constructed in very limited numbers. Only 248 were built, with just 224 of those being the restyled 2+2 model. Wearing silver paint when sold new in Switzerland, this car is thought to still sport its original interior (even though its exterior has been repainted). It should sell for between $400,000-$525,000. Click here for more info and here for more from this sale. Sovam was founded in 1930 by André Morin to produce mobile kiosks on the backs of small trucks. What a niche business. Eventually that company was spun off and they focused on other things. In 1965, they decided to build sports cars. It was a short-lived endeavor, lasting only through 1968 when the company pivoted to building small airport vehicles and moving walkways. What a weird history. 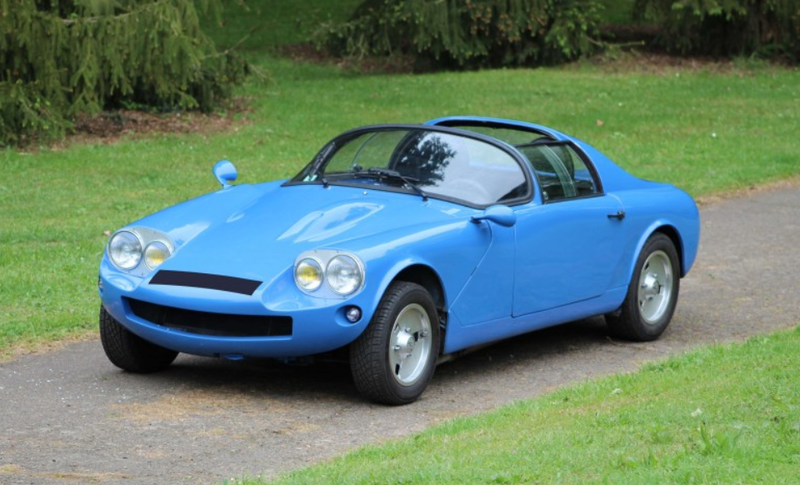 Three different Sovam models were produced with the 1100 VS being the sort of “middle model.” It’s powered by a 1.1-liter Renault straight-four making 62 horsepower. That chassis was also from Renault – coming from their 4 model. The body is fiber-reinforced plastic and reminds me of an elongated version of the Mini Marcos we featured a few weeks ago. Only 77 examples of the 1100 VS were built and the current owner of this car acquired it in 2004. When restored, the original 1.1-liter engine was swapped out for a 1.4-liter unit. This one should bring between $9,000-$14,000. Click here for more info and here for more from Artcurial. Shortly before the Giulietta went out of production, Alfa Romeo introduced the Giulia Sprint GT (in 1963), which was based on a shortened version of the Giulia sedan’s chassis. It, and later cars like the GTV, would be hugely successful and are sought after by those in the know today. 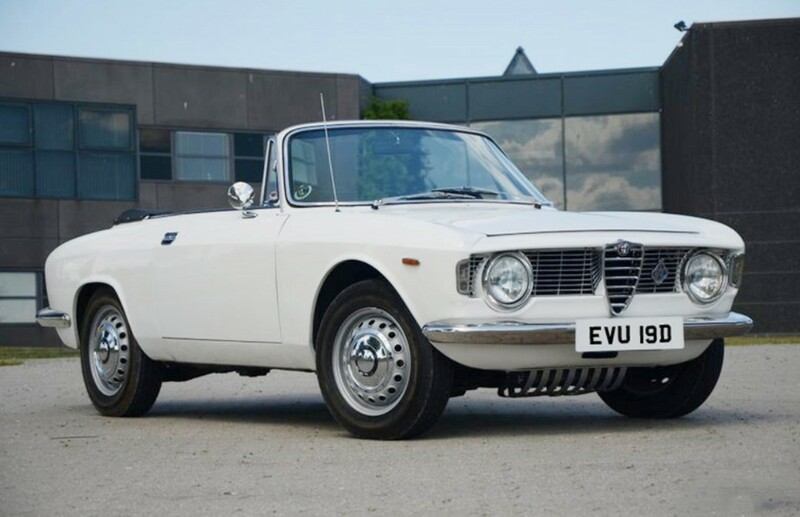 First shown in 1965, the Giulia GTC was a convertible version of the Sprint GT. The convertible conversion was handled by Carrozzeria Touring and the result is fantastic. The coupes are great looking cars in their own right, but who doesn’t want a little sun? The GTC is powered by a 1.6-liter straight-four making 105 horsepower. Only about 1,000 of these were built in three years (there were about 100 assembled at the end of 1964). This is one of 45 right-hand-drive examples built in 1966 and one of just 292 GTCs built in 1966 total. This one has been restored at a decent cost and should bring between $130,000-$175,000. Click here for more info and here for more from Coys in December. Hertz is a company that has been involved with automobiles since 1923. At one point they were part of the Yellow Coach company, a manufacturer of buses that eventually became part of GM. 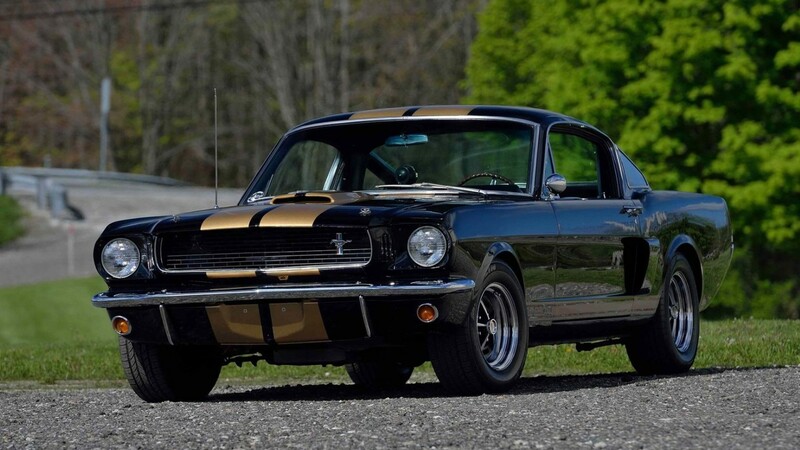 In the 1960s, Shelby built a run of special cars for the rental car agency: the GT350H. The GT350 is powered by a 4.7-liter V-8 that was modified by Shelby to put out 306 horsepower. The Hertz cars were almost all painted black with gold stripes. Dubbed “Rent-a-Racer,” the GT350H could be picked up at your local Hertz counter – if you were a member of their Sports Car Club. Back in the day, people rented these and entered them in SCCA events. The fun legend is that some would be returned to Hertz with remnants of a welded-in roll cage. There were 999 of these built – and those that hadn’t been totaled in racing accidents (it had to have happened at least once) were returned to Ford after a specified amount of time. Ford removed any go-fast parts aspiring race car drivers may have installed and then flipped the cars onto the public market. Imagine something like this today. It would never happen. It’s like if you could roll up to Avis and request a new Dodge Demon to take to the drag strip. Society, as litigious as it has become, would never allow for it. This is a piece of motoring history because it is a product of its time. And because of that, it is really, really cool. This well documented, well presented example can be yours. Click here for more info and here for more from this sale. This one’s a classic – and in a classic livery. The Ford Cortina was a large (for England) family car offered as a two or four-door sedan (or wagon). 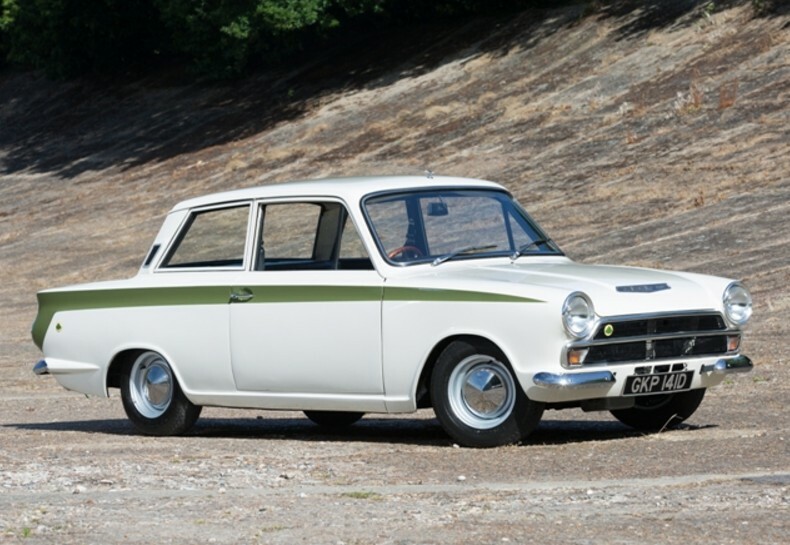 Built by Ford UK, the first generation was available between 1962 and 1966. The nameplate continued on European Ford vehicles through 1986. This hot Lotus version of the Cortina came about after Colin Chapman had someone build a twin-cam version of the Kent engine that normally powered the Cortina. Ford must’ve liked it so much that they asked Chapman to fit the engine to some Cortinas so they could homologate it for racing. They were assembled and tuned by Lotus, but sold through Ford dealers in the U.K. It was a factory two-door hot rod that predated the muscle car era, with the first generation of the Lotus Cortina having been sold between 1963 and 1966. That Lotus-tuned engine is a 1.6-liter twin-cam straight-four that puts out 105 horsepower. There are a bunch of lightweight, go-fast parts attached too, and just about all of the 1,000 examples constructed were painted white with the green stripes. This car was made roadworthy in 2014. It’s a great example of a sought after car that has gained credibility in collector circles on both sides of the Atlantic. It should bring between $45,000-$52,000. Click here for more info and here for more from this sale. The Costin brothers are probably better well known by the companies they founded than by their names themselves. Mike Costin co-founded Cosworth while brother Frank Costin worked at Lotus and co-founded Marcos before joining Roger Nathan in 1965 to build a prototype race car. Costin did the chassis and body and Nathan worked on the engine. That engine was a one-liter straight-four tuned to the max, putting out 100 horsepower. The chassis is made of tube-framed steel at both ends with plywood in the middle. The body on this prototype is aluminium (later cars were fiberglass). Now a coupe, it was originally an open-top roadster. This is the original Works prototype racer and was campaigned in period by Roger Nathan. Nathan did win the 1966 Coupe de Paris in this car before selling it in early 1967 (when it was converted to a coupe). The engine was also replaced at this time and now carries a Twin-Cam Lotus 1.6-liter straight-four. The car is being offered from the estate of the man who bought it in 1967. It raced for a few seasons before being parked and is being offered in as-parked condition. It’s the perfect project car for someone who wants a car that is eligible for many historic races. It should sell for between $36,000-$43,000. Click here for more info and here for more from this sale.